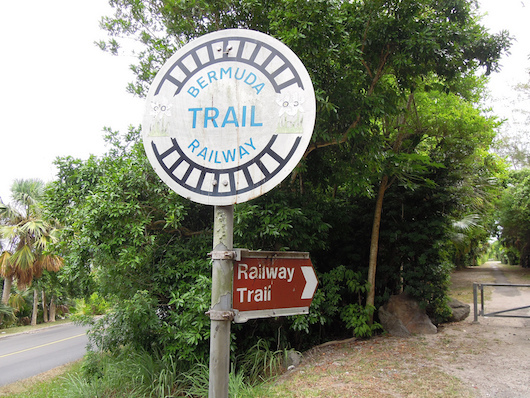 The Bermuda Railway Trail follows an abandoned rail bed for some 26 miles, covering most of the island from Somerset in the west to St. George’s in the east. 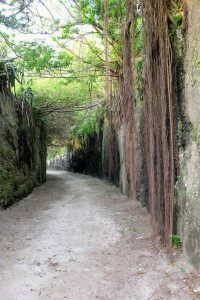 The trail offers the best longer, off-road running opportunities in Bermuda, as well as ‘connections’ to some of our other favorite running routes on the island. There’s good variety: fields, farms, parks, historic sections, lush foliage, and some very pretty coastal sections. There’s a variety of surfaces — some paved, some hard dirt, and some tougher, narrower spots. In a couple of sections the trail ends abruptly and one must use a road connection (some are narrow with little shoulder/sidewalk) The trail is not 100% continuous — there are some breaks and some sections that are not reflected on a map. Once you’re on it, the trail itself is well-signed. Some sections are more interior (generally the far west going east), with more coastal sections from Hamilton heading east. The nicest sections are in St. George’s around Ferry Reach, paralleling N Shore Rd. on Bailey’s Bay, and from Hog Bay Park to the western terminus in Somerset . We have a separate post describing and mapping few favorite sections of the Railway Trail. Below is a link to an overview of the trail, with detailed description of several sections, with information on trail access points. Once you are on the island, there ‘s a free free Railway Trail Guide from a Visitor Information Centre located at the Royal Naval Dockyard, in Hamilton or in St. George’s.